Warning of U.S. hyperinflation within six to nine months from now, John Williams of Shadow Government Statistics provided a September 14, 2010 note to clients regarding this recent 2010 update to his original report entitled Hyperinflation Special Report, Commentary Number 263. "Systemic Turmoil is Unthinkable, Unacceptable but Unavoidable. Pardon the use of the Aerosmith lyrics in the opening headers, but the image of tap-dancing on a land mine pretty much describes what the Federal Reserve and the U.S. Government have been doing in order to prevent a systemic collapse in the last couple of years. Now, as business activity sinks anew, much expanded supportive measures will be needed to maintain short-term systemic stability. Such official actions, however, in combination with global perceptions of limited U.S. fiscal flexibility, likely will trigger massive flight from the U.S. dollar and force the Federal Reserve into heavy monetization of otherwise unwanted U.S. Treasury debt. When that land mine explodes — probably within the next six-to-nine months, the onset of a U.S. hyperinflation will be in place, with severe economic, social and political consequences that will follow. The Hyperinflation Special Report is referenced for broad background. The general outlook is not changed." This article was brought to my attention by Lana Arnold of Online MBA and The Learning Advisor, an association promoting online education. An MBA education is expensive; however, it provides a fundamental background on general economic concepts, such as inflation and macroeconomics. For more information, please see Top Online MBA Programs. The Federal Reserve has been a nightmare for the American people. It inflates the money supply, thereby devaluing already-existing money and placing a massive hidden tax on the people via rising prices. It also uses its monopoly power to cause interest rates to go up or down, usurping the rightful place of the market and causing massive malinvestment and generally an improper and unproductive allocation of resources. The Fed also causes the boom-and-bust cycle through its manipulations of the currency and credit supply. It serves as the government’s partner in perpetually expanding the “welfare-warfare state,” allowing the state to spend far more than it could ever hope to reasonably raise through direct taxation. And of course, the fact that all Federal Reserve notes enter the economy as debt with interest attached (but never created) has led to a situation where it is literally mathematically impossible to pay off the debt. In sum, the consequences of such a system have been disastrous for average Americans — hence the growing calls to audit and even end the Fed. But now, imagine such a system at the global level. And it isn’t just a mental exercise; the global central bank is already emerging. As bad as the Fed has been for America — and indeed the world — a similar system at the international level would be far worse. Disaster might even be an understatement. One of the most serious threats posed by a global central bank and world fiat currency is the fact that it would allow the emerging planetary regime to print its own money and finance its activities independently. That means wealth could be secretly siphoned away from all of humanity to pay for armies, tax collectors, courts, bureaucracies, law enforcement, wealth redistribution, propaganda, and much more. With no limits. But to advocates of such a system, that is one of its primary benefits. “A super-sovereign reserve currency not only eliminates the inherent risks of credit-based sovereign currency, but also makes it possible to manage global liquidity. A super-sovereign reserve currency managed by a global institution could be used to both create and control the global liquidity,” wrote Chinese central-bank boss Zhou Xiaochuan in his public paper calling for a world currency. “The centralized management of its member countries’ reserves by the Fund will be an effective measure to promote a greater role of the SDR [Special Drawing Rights, the International Monetary Fund’s first effort at a world currency] as a reserve currency.” Of course, communists have always supported control of “liquidity” (Karl Marx was a strong advocate of central banks with a monopoly on currency and credit). But to people who care about freedom and prosperity, the communists’ support should be a huge red flag. The United Nations has also backed global currency proposals for the same reason. In a report earlier this year calling for the end of the dollar’s status as a reserve currency and a new monetary regime controlled by the International Monetary Fund, the UN’s World Economic and Social Survey for 2010 points out that, “Such emissions of international liquidity could also underpin the financing of investment in long-term sustainable development.” The term “sustainable development” — especially when used by the UN — is often used to refer to stronger central planning, population reduction, more land in government hands, and other ideas repugnant to average Americans and the U.S. Constitution. Other schemes for “international liquidity” could be even worse. Hiding behind the passive voice, a separate report by the UN Conference on Trade and Development adds in the concept of wealth redistribution: “It has been suggested that in order for the SDR to become the main form of international liquidity and means of reserve holding, new SDR allocations should be made according to the needs of countries.” It then promotes worldwide central planning to “stabilize global output growth” by issuing more SDRs or retiring them as the emerging global government deems necessary. As it stands, wealth redistribution around the world is bad enough. Surrendering that power to a global institution would be a nightmare. In its report published earlier this year, the IMF also recently came out in favor of allowing it to print its own money to provide “international liquidity.” “A global currency, bancor, issued by a global central bank would be designed as a stable store of value that is not tied exclusively to the conditions of any particular economy,” the paper says. “The global central bank could serve as a lender of last resort, providing needed systemic liquidity in the event of adverse shocks and more automatically than at present.” In laymen’s terms, the IMF, with its power to “emit liquidity” out of thin air, would be empowered to “bail out” companies, governments, and whomever it wished. If you thought the Fed handing out trillions of dollars to the big banks and other insiders was bad, just wait until a global central bank exercises that power. Allowing the emerging global government to supply its own money would free it from the constraints of having to raise money through national contributions or direct international taxation. But of course, printing all of this new “liquidity” and financing all of its ambitious projects would be inflationary by definition. And this inevitably would represent a massive problem. To understand the effects, one can look to history and examine examples such as what occurred in the Weimar Republic of Germany, where the money supply was inflated to such an extent, to finance government spending and war debt, that Germans actually found their money more valuable to burn as fuel than to use to purchase items. Or, in more recent years, the tragedy of hyperinflation in Zimbabwe, where inflation exceeded millions of percent per year and it could cost a person billions of dollars for a loaf of bread, provides a more current warning. Even in America — with a comparably stable currency up until now — inflation has wreaked havoc on the economy and the lives of citizens, as we have become a country where husbands and wives must both work to make ends meet. And these all happened in a world where there was still a check on unlimited inflation of fiat money — the fact that citizens could quit using it and purchase other currencies that were not losing their value as quickly. But under a global fiat monetary regime, there would be no such option. Existing monetary unions are often seen as the model for a global currency by advocates of such a system. But surrendering control over money to supranational institutions has consequences, as the people of the Eurozone are discovering. For one, according to data compiled by the European Central Bank, economic growth has slowed dramatically in countries using the euro since the introduction of that single currency — a phenomenon not observed in other areas of the world. But more importantly, the goal of keeping the monetary union intact is leading to ever greater fiscal and political integration as rules are harmonized and authority continues shifting from nations toward European institutions. During the height of the crisis in Greece, other European governments were forced to bail out the Greek regime over fears that it could bring down the euro. But on top of that, Eurozone heads of state and government got together and used the crisis as an excuse for pushing deeper integration and the imposition of “economic governance” at the European level. Around the same time, IMF boss Dominique Strauss-Kahn joined the calls for deeper integration in Europe, offering IMF funds with strings attached. “The launching of the euro was only a first step,” he explained. “You can’t have a single currency without having a more coordinated economic policy.” And indeed, such economic control will also lead to more political control — just as we have seen with the transformation of the European Common Market into the European Union. Obviously, if the euro is the model for a world currency, the same phenomenon would occur at the world level. That would mean closer integration among the nations of the world, the vast majority of which are ruled by totalitarian regimes of various varieties. A world fiat currency, then, would be the surest way to accelerate the development of a true global government and the accompanying destruction of national sovereignty. But to planetary currency enthusiasts, that is a non-issue. Noting that there would be critics of the development of a world central bank, especially in America, Council on Foreign Relations insider and global fiat currency promoter Jeffrey Garten points out in an article for Newsweek, “Among their many charges, critics will protest the establishment of ‘world government.’ But we have a World Trade Organization with legally binding powers over trade disputes. We have a World Health Organization for communicable disease with the ability to quarantine entire countries. And a World Court functions today that has considerable legal and moral clout.” Dismissing critics protesting the establishment of a world government by pointing out that it already exists in rudimentary form is hardly likely to pacify those critics. But what would a global currency really mean aside from the destruction of the dollar and the U.S. economy? “A global central bank would be a disaster,” financial guru Bob Chapman, editor of the International Forecaster, told The New American. “It means the acceptance of world slavery.” Chapman also pointed out that the present international monetary system was being deliberately destroyed precisely to bring about a global currency like the bancor. “It’s just not fiscal and monetary policy. It is every facet of your life that these elitists want to control.” And they’re moving rapidly toward that goal. In addition to printing money, the emerging global central bank and its affiliates are already usurping other powers traditionally exercised at the national level. In his Newsweek article, Garten calls for the new planetary central bank to be the “lead regulator” of all sorts of financial institutions, monitor risks, push national authorities to “modify their policies,” coordinate national “stimulus programs,” orchestrate a “global-stimulus plan,” force taxpayers around the world to bail out companies, and even act as a bankruptcy court. The IMF, in its own report, called for global “imbalance” taxes, capital controls, and a true world financial regulatory regime. A lot of that is already coming into being, but as the new monetary order develops, the agenda will only accelerate. Omnis’ Rickards also has some ideas about how America can put a freeze on the emergence of the global paper currency: cuts in taxes and spending; higher interest rates to strengthen the dollar; and, eventually, getting back on the gold standard. “The U.S. is in the best position to go back to the gold standard,” he explained, pointing out that, with an estimated 8,000 tons, America has more gold than any other country. “The first country that goes to the gold standard will — in effect — dominate the world of finance because they will have the currency that everybody wants. ... Would you rather have a gold-backed dollar or a paper SDR?” What’s missing right now, he said, is just the political will to do it. “What you’re going to see over the next few years is a global struggle between the forces who want to create new forms of paper and just give it a different name and a different issuer and continue to flood the world with paper liquidity and keep the game going on the one hand, versus people who will recognize that the only true form of money is gold and will start bidding up the price of gold against the dollar,” Rickards predicted. It is ironic that the likely imminent collapse of the world’s current fiat “reserve currency” is being used as an excuse to implement a global fiat currency. But it is extremely serious. Escaping the elites’ clutches would become almost impossible as wealth is steadily transferred from humanity to the banking oligarchy and its ever-expanding global government. And so the scheme must be prevented. A most provocative interview was aired on September 17, 2010 from Costa Rica where Jim Willie describes the short squeeze gold raids now being put on the LBMA by some wealthy Arab and Chinese billionaires. They definitely smell blood in the water and they are in a position to demand physical delivery. Jim Willie is the Editor of Hat Trick Letter and a well-connected private consultant in the areas of financial markets, currencies, and commodities. According to Jim’s source, "This will not end until the Anglo Bankers are Dead and De-nutted." The move toward a cashless society is accelerating in Sweden as plastic payments become the norm and various government officials, unions, and high-profile Swedes push for a ban on cash, supposedly to reduce robberies. But opposition to the proposal is mounting as well. Swedish buses have already stopped accepting cash after a series of robberies. Commuters must now pay at a separate store before getting on the bus, or use a cell phone. The next targets for the anti-cash movement are banks and retailers. When asked about a retail cash ban, Swedish Work Environment Authority (Arbetsmiljverket) boss Mikael Sjberg refused to rule out the possibility. "It just depends on how risky the situation is. 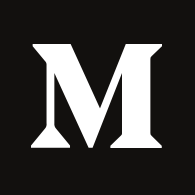 We have very extensive possibilities to explore," he told a Swedish labor union publication cited by TheLocal.se, an English news service in Sweden. "It is not acceptable that people go to work in fear and concerned that they could be subject to a robbery,” said Sjberg. A spokesman for the Work Environment Authority, Bernt Nilsson, acknowledged that it would take at least several more years to prepare the transition. But progress is being made. Numerous Swedish officials have also been busy demonizing cash, attempting to link it with criminality, the black market, the “shadow” economy, and thieves. And so, pressure is building to do something about it. Unions are also helping to lead the charge toward a cashless Sweden. "If we can reduce the amount of cash in the banks and in society in general, robberies will also be reduced," Marie Look with the Swedish bank workers' union told the BBC for a recent article. "If in the long term we abandon cash completely, there will be no robberies, because there's no point in robbing a bank if there's no cash there to steal,” she added, perhaps not realizing that the workers she purports to represent would mostly lose their jobs under a cashless regime. Other unions are pushing the issue, too. And even some Swedish celebrities are joining in. "There are no direct practical reasons, as far as I can see, to have coins and banknotes," wrote Abba star Bjorn Ulvaeus in a recent blog post. "There are obvious advantages in getting rid of them. Sweden should be able to be the first country in the world to do this." The Swedish central bank has remained neutral so far, though its second-in-command said earlier this year that cash was more expensive to society. But not everybody in the Nordic country of nine million — one of the few eligible nations that voted not to join the single European currency union — is excited or neutral about the prospect of a cashless society. Opposition to abolishing cash has already started to spring up. And as the calls grow louder, criticism is building. "If it's impossible to pay cash when you buy stuff, it's also impossible not to leave electronic footprints behind you, and the electronic footprints from what you buy put together can tell the entire story about your life. This can be very sensitive information," Par Strom of the New Welfare Foundation in Stockholm told the BBC. "Most people don't want this total surveillance society." Countless critics have argued that the government’s failure to properly prevent and punish crimes is the real problem, not the existence and use of cash. Of course, Swedes are also disarmed for the most part, and even those with weapons are forbidden to use them in self-defense, let alone to protect property. Other opponents point out that homeless beggars, churches with their collection plates, street entertainers, and countless others would likely be devastated by such a scheme. But government power-mongers don’t seem concerned. “Cash is one of the alleged banes of society that has long been in the sights of statist control-freaks everywhere,” notes analyst Pater Tenebrarum. “Fear not though — no government can really eliminate cash anyway, even though many would probably like to do so,” he says. “The reason is that the shadow economy would then simply move toward using the cash issued by a foreign nation, or would move to a gold payment system.” While the government could and probably would outlaw such schemes, Tenebrarum still doesn’t believe it would stop underground trade. He argues that a ban on cash would lead to Swedes suffering from decreased living standards. And it almost certainly would. By shutting down the “shadow” economy — a phenomenon frequently observed in countries with massive governments — goods and services would become far more expensive. The list of problems is virtually endless. Cash, Tenebrarum points out, also allows people to partially extricate themselves from the inherently unstable fractional-reserve banking system. And so, for those reasons and others, “such attempts by the bureaucratic nanny state to encroach upon the rights of allegedly free people should always be resisted,” he writes. But despite the criticism and fervent opposition, judging by current trends, a cashless society could be close at hand. Credit and debit cards now dominate payments in Sweden and in most of the developed world. And the propensity to use plastic instead of cash is only growing. Quickly. Cell phones are also increasingly being used for payments, especially in Sweden. Eye scans and fingerprints linked to accounts are making headway in trade too. In other parts of Europe, certain nightclubs are even using gimmicks to entice their customers into being micro chipped to pay for drinks. The amount is simply deducted from the electronic chips implanted under their skin. That trend, too, is accelerating, with some people taking chips to provide "security" or easy access to their medical records as well. The dangers of a cashless society are huge and cannot be ignored: Everything would be tracked and controlled; privacy would be non-existent; the government would be close to omniscient; people could be literally shut off; electrical problems, electronic warfare, and hackers could bring trade and civilization to a standstill; and much more. Therefore, such a regime must be prevented. Alternative Payment Experts - All five alternative payment experts said PayPal is the U.S. market leader and will continue to dominate the space. 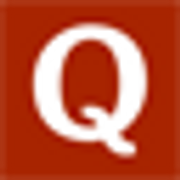 Mobile payments and non-­U.S. opportunities represent areas of growth. One source said PayPal will enjoy significant growth opportunities, especially from its Facebook agreement. Source reported high levels of competition. MasterCard’s API could be a game changer while Visa’s CyberSource purchase could open up a large merchant network to its services. Jon Matonis, a digital currency consultant and author of The Monetary Future blog, said MasterCard and Visa are not yet significant challenges to PayPal. Still, they could eliminate the need for PayPal if they can match it in offering easy online transactions. Significant opportunities await PayPal, such as moving into direct deposits and, outside of the United States, virtual currency in online gaming and serving the unbanked in developing countries. Also, see the April 2010 Blueshift Research interview excerpt here. Thursday's sale is the first to a central bank since last November's sales. In a statement, the IMF said that at the end of July a further 88.3 tonnes had been sold through on-market sales that it announced in February. This article takes up where the first part left off: the dismantling of the London Gold Pool in March 1968. The US authority's fight to keep gold pegged at $35 had by no means ended with the Pool's demise. Instead it shifted to a new front. That same month a massive gold embargo against South Africa, the world's largest gold producer, was initiated by the US, a battle that would last till early 1970. The US led embargo against South Africa, backed implicitly by the largest military in the world, highlights the gradual but steady tendency for authorities to back the failing $35 peg by forceful means. This is the inevitable route taken by any state-run financial system experiencing difficulty. Whereas in a free banking system mistakes are fixed through market discipline, competition, and failures, the state's mistakes in banking are maintained as long as its monopoly on force can keep these mistakes from destroying the system. To recap, the Bretton Woods Agreement negotiated after World War II set the value of the dollar at 0.81 grams. This value was backed by the United States Federal Reserve's promise to convert all dollars into gold at the stipulated ratio of 0.81 grams, the more well known ratio being $35 dollars to one ounce. This promise was further enhanced by the fact that the Fed held some 21,000 tonnes of the metal, more gold than all other central banks combined. Dollar's convertibility was limited to foreign governments and central banks — private citizens in both the US and overseas who owned dollars held what was essentially inconvertible paper money. To understand this system, it helps to compare it to a hypothetical world of private banks issuing currency in a free market. In such a system, the option that currency holders have to exercise gold convertibility forces discipline on individual banks. A bank that issues more of its branded money than the market is willing to support, say by lowering its own interest rate on loans below the market's rate, will soon face a wave of its own currency returning to it for conversion. The irresponsible bank's gold reserves will decline and it will be forced to call in loans to rebuild reserves, or increase interest rates back to at least the market rate to attract gold deposits. In a free banking system, customers are free to choose the notes of whatever banks offer the most reserves to back up their issue, further disciplining banks that might wish to expand beyond a reserve ratio that customers prefer. At the extreme, transgressing banks are punished by run which may lead to bank failure. In that case, remaining assets are taken over by competitors, restoring balance to the system. The US Federal Reserve operating under Bretton Woods was by no means exempt from the same pressures that individual banks in a free banking system would be subject to. As my first article pointed out, a massive US balance of payments deficit began to appear in the 1950s, driven in part by government spending overseas including military expenditures and foreign aid to a rebuilding Europe. To fund these expenditures, the Federal government issued bonds which were bought by the Fed with newly printed dollars. By 1951 the Fed held more treasury bonds on it's balance sheet than gold. As happens in a free banking system, once the mass of dollars created by the Fed exceeded demand they began to be returned to the US for conversion into gold by foreign central banks. This process began in earnest in 1958, when US reserves plummeted by 9%. A free bank would have been forced by competitive forces to reduce money creation, call in loans, increase interest rates, and rebuild reserves. Here is where the comparison between the Fed under Bretton Woods and free banks end, because the Fed and its partner the US government have one other policy option that the free banks don't; they can resort to their monopoly on force. Thus began the constantly escalating attempts through the 1950s and 60s to prevent the same market forces that exercise discipline on free banks from exercising discipline on the US. The monetary authority's goal was to forcibly stem the flow of US dollars overseas, reduce the gold price, and plug the rising number of conversion claims for dollars to gold on the part of foreign governments. For instance, in 1959 Eisenhower made it illegal for Americans to buy gold overseas — extending Roosevelt's 1933 ban on American domestic holdings of gold. In 1964 a new tax was imposed by President Kennedy on foreign currency deposits to prevent Americans from investing overseas — the Interest Equalization Tax. In August 1970 President Nixon was given discretionary authority to impose wage and price controls on citizens. Soft nanny state campaigns by the state to discourage tourism and therefore dollar outflows, including Lyndon B Johnson's comments that "We may have to forego the pleasures of Europe for a while," and "I am asking the American people to defer for the next two years all non-essential travel outside the western hemisphere," became common. In 1968 Johnson would also forbid all American investment in Europe and impose limits on investments elsewhere. All this is terribly ironic as Kennedy, Johnson, and Nixon were clamping down on American economic freedoms at the same time that they were waging a war of aggression in Vietnam. By forcing the American public to spend less overseas, Kennedy and Johnson realized they would free up more room for their own overseas campaigns. There are umpteen examples of forceful means being used to reduce the freedom of individuals in order to save the $35 peg from that era. One by one they failed, including the London Gold Pool, only to be replaced by even stronger forms of coercion. 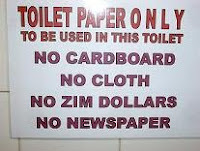 The last and probably the most overtly aggressive of these was the South Africa embargo. Leaving off from the last article, central banks asked for the London gold market to be closed and dismantled the gold pool on March 15, 1968. Without price suppression from pool sales, the market price of gold immediately vaulted to $39 upon the market's reopening. That same day, in what became to be called the Washington accord, western central banks led by US Treasury Secretary Robert Fowler announced that the world's monetary reserves were "sufficient" and no subsequent purchases or sales by central banks in any market would be necessary. This last seemingly innocuous statement had large repercussions. If central banks ceased buying gold, monetary demand for the metal would dry-up. South Africa, producer of some 75% of the world's gold, would suddenly find no outlet for a bulk of its new gold. After all, the lion's share of world gold demand was by central banks. Fowler hoped that the boycott would force South Africa to funnel gold sales into the relatively small London market, dominated by jewellers, speculators, and other private parties, depressing the market price from $39 back to the official one at $35. This amounted to substituting the London gold pool, active from 1961-68, and its dampening influence on the gold price, with South African sales, the latter without South Africa's permission. Letters were sent to 95 central banks asking them to desist from all gold purchases. The boycott had started. From the beginning the boycott was a failure. Rather than falling the gold price steadily rose from $38 to $42. The 20% price differential between the official price of $35 and the market price put a mockery to the whole managed Bretton Woods system. In essence, the market was saying it didn't believe that the US dollar was worth the gold value that the authorities claimed. Rather than a dollar being convertible into 0.81 grams, the market was betting that, once the chips were down, the dollar was likely only convertible into just 0.67 grams. At the same time, the price differential provided a tremendous arbitrage opportunity to central banks. To make an easy profit, all they had to do was bring their dollars to the Federal Reserve, convert them to gold at $35, ship their horde to London, and sell it for $42, further exacerbating the US's already significant gold outflows. Despite the pressure on South Africa to sell in London, the London gold price never caved. Rather than selling gold on the market, the Reserve Bank of South Africa skirted the boycott by purchasing the gold produced by mining firms and hoarding it. By the end of 1968, South African gold reserves at the central bank had doubled from an opening balance of about $600 million to $1.2 billion. While this kept gold off the London market and prices high, it meant that the nation could no longer send its main export product overseas to pay for imports. Luckily, South Africa had been running a significant capital account surplus since early 1965. World equity markets had been rising since the last bear market bottomed in 1966. Foreign investors, bullish on South Africa, were flooding South Africa with foreign currency, and for the time being there was no need to sell gold. The boycott amounted to a game of chicken between the US and South Africa. At some point the flow of investment capital into South Africa could dry up and the nation's gold reserves would have to be sold in the open market to fund imports. But before that, the differential between gold's market price and the official price could stretch even wider, weakening the resolve of the participants in the American led boycott to the point where central banks, in particular those in Europe, might start buying gold again. Many South Africans hoped to see an official devaluation of the dollar, i.e., a rise in the official price of gold, South Africa's main source of income. With the market price of gold at $42, arbitrage profits might get so tempting that the world's central banks would converge on the US en masse to convert dollars to gold. US reserves would plummet, and a devaluation would be forced. In this game of chicken, it was a question of what happened first: South Africa being forced to sell its gold or a run on the US forcing it to give up $35 gold. South Africa actively tried to sell some of its hoard by targeting potential boycott breakers with cheap gold prices. Portugal broke the blockade in late 1968 when its central bank bought some $150 million in gold from South Africa. They would buy another $120 million in 1969. Rumours persisted that other European central banks had crossed the picket line too. The International Monetary Fund was also a potential sop for South African gold. IMF rules stipulated that the fund was required to buy all gold offered up to it by members. This, at least, was the opinion of IMF head Pierre-Paul Schweitzer and most IMF officials. Treasury Secretary Fowler held the rather convenient opinion that the IMF had no obligation to buy anyone's gold, in particular South Africa's. Rather than accepting a South African request to buy 1 million ounces of gold in May 1968, the IMF board of directors deferred any decision on the legality of gold purchases, thereby giving South Africa the cold shoulder. The US, with 25% of board votes, had no small part in determining this policy. This closed yet another avenue for South African gold. Through most of 1968 South Africa would funnel small tester sales into the London market to determine the resiliency of prices. Prices fell to $38, but by year's end would be back at $42. In late 1968 three private Swiss banks agreed to buy $200-400 million worth of gold from South Africa, selling this gold on the market. The South Africans were unwilling to deal with their traditional agents the Bank of England, reportedly because the Bank's close relationship with the Fed would compromise the secrecy of South Africa's sales. 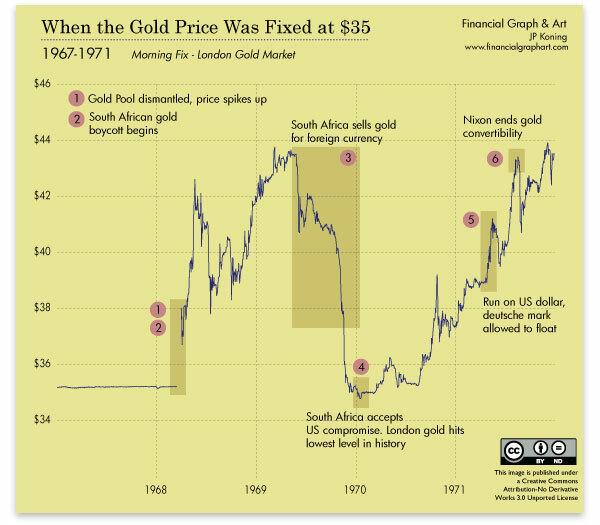 With price still far above $35 in October 1968 and South Africa able to sell some of their gold, the monetary boycott was an all out failure. Henry Fowler decided to offer South Africa a compromise. He would allow the South Africans to resume monetary gold sales, but only to the IMF, not central banks. Furthermore, sales could only be made when the market price of gold was below $35 or South Africa was experiencing a capital account deficit. This plan would set a floor for the gold price at $35. Since all South African gold would flow to the IMF once price fell below $35, the market would no longer be absorbing this rather considerable lode of metal, and price would stabilize. As they were still running a capital account surplus and the price of gold remained high, confident South African officials ignored the offer. Around the world, the bull market in equities that had begun in 1966 was ending as markets began a downwards spiral into the 1969-70 bear market. South Africa, once attractive to investors, began to lose its shine. By the second quarter of 1969, South Africa's capital account revealed a deficit, its first in three years. Net inflows of private capital amounted to a paltry £11.7 million for the first half of 1969, down from £218 million the year prior. The pillar that had been allowing South Africa to avoid open market gold sales had cracked. To fund imports, South Africa began to sell its gold in earnest. Reserves, which had hit a peak of $1.4 billion at the end of May 1969, fell to $1.2 billion by July and $1.1 billion by August. The gold price in London fell from $43.50 to $41. According to estimates, all new South African gold production, about 20 tonnes a week, was now hitting the market. The sell off turned into a bloodbath in late October. Prices broke below $40. Through November gold continued to plummet, falling into the $35 range at the end of the month. On January 16, 1970 prices touched $34.80, the lowest level since the London gold market had reopened in 1954. At prices significantly below $35, it made sense for central banks to arbitrage gold, but no longer by drawing on US reserves. Rather, banks could buy in London at $34.80, ship the gold to the US for 10¢, and have the Fed issue dollars for gold at $35, after taking a 7.5¢ commission. This promised a sure 2.5¢ per ounce profit. The effect was that the US was now accumulating reserves. The tables had turned, and Fowler's plan had worked. The $35 peg seemed to have been saved, though at the expense of freedoms lost by everyone caught up in the endeavour. 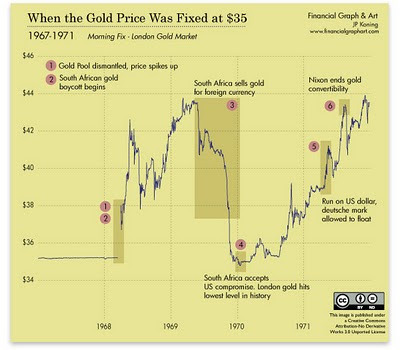 With gold at $35, in December 1969 South Africa agreed to the US compromise offered more than a year before. Its freedom to sell monetary gold was still drastically limited — it could still only sell to the IMF, and at prices below $35 — but this was better than nothing, and at least a floor had been set below the gold price. Newspapers and magazines were filled with fawning accounts of the US's victory. A January op-ed in the New York Times noted that: "Gold's power to disrupt the international monetary mechanism has now been greatly reduced, and possibly ended. Under Secretary of the Treasury Paul A. Volcker has voiced the hope that this latest move will dispose of gold as a 'contentious monetary problem'." This celebration would be short-lived. Even with South Africa selling most of its gold in London, the gold price steadily rose through 1970, ending the year at $37.50. By August 1971 it would be trading in the free market at $43.50, again 20% above the official price. In spring of 1971 a run on the US dollar began. Central banks lined up at the Fed's doors in ever increasing numbers to demand their gold. On August 9, the British economic representative asked to convert an astonishing $3 billion into gold, or about 2,500 tons. The South Africa gamble had been the last trick up the US's sleeve, and on August 15, 1971 President Nixon officially abandoned the dollar's $35 peg when he ended convertibility of dollars into gold. The 1968-69 South African gold embargo is not just an interesting historical quirk. It also provides a mirror to understand the means by which governments will combat the present failure of the financial system. Like the $35 gold and Bretton Woods, much of the world's financial architecture has been designed by government technocrats. Fannie Mae, Freddie Mac and their foreign equivalents like the Canadian Mortgage and Housing Corporation dominate much of the home lending markets. The Federal Reserve and other central banks control the supply and quality of money, and agencies like the SEC, Fed, and OFHEO have monopolies on regulation. This architecture is crumbling. In a free market, housing lenders and banks who fail at their task are taken over by more able competitors. Private regulators who do a poor job as watchdogs have their reputations crushed, to be succeeded by regulators who better understand their domain. Charities that bail out those who don't deserve help will lose funding at the expense of charities that better target aid. In this way failed architecture is renewed. Much like the US's decision to save Bretton woods by coercing South African gold sales, today's governments will resort to ever more authoritarian measures rather than allowing their pet institutions to fail. Already the legislation governing central banks has vastly expanded in scope, federal housing agencies have had their mandates dramatically increased, and government regulators who fell asleep at the wheel are being given ever greater powers. While this may work temporarily, much like South Africa's forced sales saved the $35 peg for one more year, the financial architecture's endemic problems will still exist. Instead of being purged, they will only crop up further down the road, more serious than ever. And when this happens you can be sure our elected officials will again try to save their pet institutions by taking away our liberties. John Paul Koning is a financial writer and graphic designer who runs Financial Graph & Art. His Visual History of the Federal Reserve, 1914–2009, Wallchart is available here. The Economist, January 6, 1968. New York Times, January 4, 1969. New York Times, July 13, 1969. New York Times, June 16, 1968. New York Times, Jun 28, 1968. New York Times, Jul 26, 1969. The Economist, Aug 30, 1969. New York Times , July 13, 1969. New York Times, Aug 15, 1969. The Economist, Nov 22, 1969. New York Times, Jan 5, 1970. Peter Bernstein, The Power of Gold. Pg. 351. Gold-price history charts denominated in US dollars show a flat line at $35 that runs through most of the 20th century. Thirty-five dollars was, after all, the official gold price as set by the United States Treasury from 1934 on. Prior to 1934, the gold price had been fixed at $20.67 for almost a century, before President Franklin Roosevelt confiscated Americans' gold and revalued the price to $35 that year. The $35 price was an integral part of the Bretton Woods Agreement negotiated after World War II. Bretton Woods specified a system of fixed parities between the US dollar and other industrialized currencies, and the convertibility by foreign central banks of US dollars into gold at $35 an ounce. In other words, each dollar paid out around .03 ounces of gold, or 0.888671 grams. This was not like the classical gold standard of the 1800s but a pseudo gold standard foisted on the world by central planners. Convertibility could not be exercised by private individuals, only central bankers, and most currencies were not redeemable in gold; only the dollar was. Again, gold charts show a flat line through the Bretton Woods era of the 1940s, '50s, and '60s at $35. The problem with these flat lines is that they imply that monetary authorities were able to keep the actual gold price fixed at the precise level they specified, and conversely, that the purchasing power of the dollar remained constant. This was not the case, as the market price for gold often differed from the official $35 price, sometimes quite significantly, and the dollar actually lost value against most goods, even though it was officially fixed versus gold. When doing research for a gold chart project of my own, I spent several weeks nosing through old papers and magazines for market data from the era of $35 gold. I hope to bring back into public memory the divergence of gold's market price from the official price, a data set that has been forgotten. Our chart begins in 1954 with the reopening of the London gold market, which, prior to being closed at the outbreak of World War II, had been the world's largest venue for trading the metal. Through the 1950s the London price fluctuated between $34.85 and $35.17. These upper and lower limits were set by arbitrage and the threat thereof. Foreign central banks, as stipulated in Bretton Woods, could go to the Federal Reserve in New York and convert their dollars into gold or gold into dollars at $35 plus 8.75¢ commission. The cost of shipping and insuring gold from New York to London and vice versa was 8¢ to 10¢ per ounce. Thus, when the London price traded down to $34.82 or so, it made sense for central banks to buy gold in London, ship it to New York for 8¢, then sell it to the US Treasury at the $35 official price less 8.75¢ commission, earning arbitrage profits of around 1¢ an ounce. Conversely when gold rose to $35.18 in London, it made sense to buy gold from the US Treasury at $35.0875, ship it to London for 8¢, sell it at $35.18, and earn arbitrage profits of 1¢. In the mid to late 1950s the balance of payments between the United States and the rest of the world grew ever more dramatically in the latter's favor. This was due to growing US military expenditures overseas, corporate investment outflows, and foreign aid to a rebuilding Europe. As a result, European and Japanese central banks accumulated continuously growing US-dollar reserves. Nineteen fifty-eight marked the first year in which foreign central banks exercised their convertibility rights in significant amounts and returned their dollars for gold. US gold reserves fell 10% from 20,312 metric tons to 18,290 that year, another 5% in 1959, and 9% in 1960. At the same time, the US Federal Reserve continued to increase notes in circulation, resulting in dollars being backed by ever smaller amounts of gold. Since this threatened future potential convertibility, rumors grew that the United States would be forced to devalue the dollar to staunch the outflow. The US government tried to prevent gold from leaving by twisting the arms of foreign central banks to keep their dollars, and, later, setting travel limits on American tourists overseas and US private investment in Europe. By 1958, London gold was trading closer to its $35.18 upper limit rather than the bottom limit at $34.82, which it touched in 1957. Participants in the London market — increasingly dominated by throngs of private investors and speculators — were ever more certain that the United States' plunging gold reserves would force it to dramatically devalue the dollar. In September 1960, the United States experienced its largest weekly decline in reserves since 1931 as foreign central banks went to New York for the metal. At the same time it was becoming evident that presidential challenger John F. Kennedy would win that fall's election. Kennedy's promises to lower interest rates and increase government spending convinced many that gold outflows would only increase. The Dow Jones Industrial Average plunged 12% from the end of August to October 25, hitting its lowest point since 1958. In this context, London gold prices rose above $35.20 for the first time in September 1960, and on October 20 hit $36, far above the ceiling implied by arbitrage. The next week, a speculative gold rush touched off and the price soared, briefly hitting $41 before closing at a high of $38. With London trading at an impressive 17% premium to the official price, the world's monetary architects had lost control of the market price of gold. Gold's market premium to the official price was no small matter as it questioned the very fundamentals of the planned monetary system. After all, if an ounce of gold was trading at a premium over dollar claims to that same ounce of gold, then the validity of those dollar gold claims was being challenged by the market. Furthermore, by giving foreign central banks even more incentive to exchange dollars for gold at $35 in New York in order to sell it in London at $36 to $38, the premium would exacerbate the United States' gold drain. "Gold's market premium to the official price was no small matter as it questioned the very fundamentals of the planned monetary system." At the eleventh hour, the New York Federal Reserve cut an informal deal with the Bank of England to resupply said bank with any gold it spent, at its own discretion, in suppressing the gold price. Prices soon began to fall as the Bank of England sold. As one of his last acts as president in 1960, Eisenhower tried to suppress gold demand further by making it illegal for Americans to buy the metal overseas — an extension of Roosevelt's 1933 ban on American domestic holdings of gold. By March 1961, the gold price had been strong-armed back to $35.10. Fearing another gold rush in October 1961, Western central banks formalized a plan by which they pooled together several hundred million dollars worth of gold, this stock to be mobilized to control the London gold price. Thus was born the famous London gold pool. The pool became an active buyer of gold when the London price fell below $35.08 an ounce and a seller at $35.20. In its first test — the week of the Cuban Missile Crisis in October 1962 — the pool effectively supplied the London market despite demand for the metal being greater than the 1960 gold rush. Prices could not penetrate $35.20. The pool's reputation strengthened: gold would stay benign and near $35.08 for the next few years. In 1963 and 1964, the United States would lose only small amounts of gold reserves to foreign central banks, and the London pool bought gold to support its price rather than suppressing it. Bretton Woods, the dollar, and the $35 fix seemed safer than ever. But with the Gulf of Tonkin incident in late 1964 and the acceleration of the Vietnam war in 1965, US foreign military spending exploded. This was compounded by President Lyndon B. Johnson's expensive Great Society project, paid for in part by the Federal Reserve issuing new money to buy government debt. The balance-of-payments deficit grew ever faster, and the United States lost more gold reserves to dollar-laden foreign central banks exercising convertibility and through gold-pool sales in London. US gold reserves resumed their downward trajectory, declining by 9% in 1965. At the same time, speculators were buying gold in record numbers in London, forcing price up to $35.20, the London pool's line in the sand. Things only got worse with the exit of the French from the gold pool in early 1967, tensions in the Middle East, and the collapse of the British pound in November 1967. The Tet offensive of early 1968 indicated the US commitment to Vietnam would only grow. Speculators bought en masse in London through the remainder of 1967 and into March 1968. By March 14, the members of the gold pool, having sold about $2.75 billion worth of gold to protect the $35.20 ceiling, or about 10% of the member's total reserves since the pound's devaluation, had had enough. They asked the Queen of England to close the London market the next day and dissolved the once-feared gold pool. When London reopened two weeks later, without suppression, prices immediately vaulted up to $38 and would soon rise to $42. Reviewing this period in gold's history makes evident the extreme difficulties experienced by the monetary authorities in controlling the price of gold. The typical flat $35 line on charts gives the illusion that the dollar was a stable store of value. In actuality, market prices diverged from $35 — and dramatically so in 1960. The attempt to fix the dollar at 0.888671 grams and gold at $35 — this while the dollar's purchasing power had declined versus all other goods — was a losing battle carried out at great expense. The United States and its allies would sell huge quantities of gold at prices below what a free market would have borne. In 2009, amidst some of the largest central-bank rescues and bailouts in history, let the 1960 gold rush and the eventual collapse of the London gold pool in 1968 stand as a reminder to us that central planning of monetary matters is doomed to fail. The Economist, October 22, 1960. Globe and Mail, September 23, 1960. The Economist, February 16, 1962. The Economist, March 16, 1968. ADDIS ABABA - The Ethiopian birr was devalued by 16.7 percent on Wednesday, according to exchange rates published on the central bank's website, a move welcomed by the International Monetary Fund (IMF). The birr was quoted by the National Bank of Ethiopia at a weighted average of 16.3514 against the dollar compared with 13.6284 on Tuesday. A central bank official confirmed the new rate but was not authorised to make further comment. "The IMF welcomes this move given it will help bolster Ethiopia's competitiveness," IMF representative in Ethiopia, Sukhwinder Singh, told Reuters. "It will need to be supported by appropriate monetary policy." Last month, the government unveiled an ambitious five-year economic plan which targets average annual economic growth of 14.9 percent over the period and aims to end the Horn of Africa nation's dependence on food aid. Ethiopia is Africa's biggest coffee exporter and the world's fourth largest exporter of sesame. It is also one of Africa's biggest potential markets -- with a population of 80 million -- and most of its people have no telephones or bank accounts. The devaluation is the Horn of Africa nation's fourth since January 2009. Devaluations can spur economic growth and reduce current account deficits to the extent they boost exports and discourage imports, although they carry the risk of importing inflation. "I think it's related to the new five-year plan and a strategy of export promotion and import substitution," Tewodros Mekonnen, an economist with local think tank, the Ethiopian Economic Association, told Reuters. "Obviously there's a risk it could cause inflation. It will probably also boost foreign direct investment and remittances." Inflation in Ethiopia hit a high of 64.2 percent in July 2008. After that peak, the government halted state borrowing and increased bank reserves to drive down the rate. The country's central bank also instructed private banks to restrict borrowing. The inflation rate slowed to 5.7 percent in July. "Years of high inflation have eroded the country's export competitiveness, and the government has continually favoured sharp currency depreciations to counteract this," Joseph Lake, an analyst at the Economist Intelligence Unit, told Reuters. "Though inflation has eased in recent months, this pattern of currency depreciation is likely to continue. Low levels of foreign exchange reserves, and twin fiscal and current-account deficits will continue to put pressure on the currency," Lake said. The country -- one of the world's biggest recipients of foreign aid -- is keen to attract foreign investment in agriculture and mineral exploration.